First of all... let's get you into the "mood". Here's a little ♫tuneage♫ for you... now that you have that playing you can imagine the mood I was in while I decorated this little scene. For me... the winter season is the most difficult because I'm away from my native country, and most importantly my family. 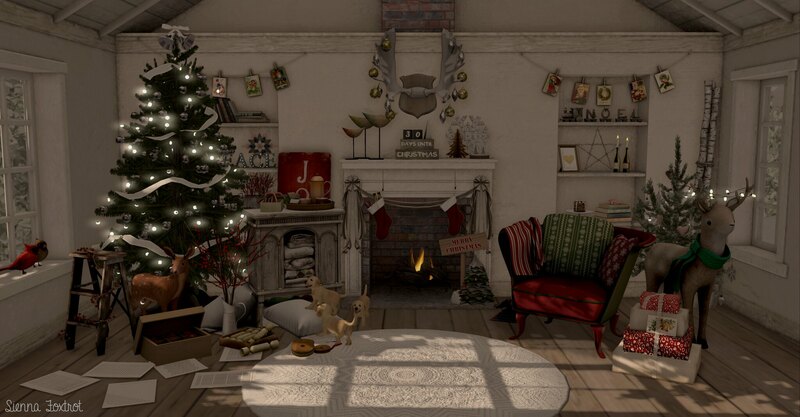 I take a great deal of comfort spending time with friends in SL and well... decorating during this holiday season. For me, if I can make my pixel home feel like Christmas then I've done it right. I held off of snapping this pic for a bit because I really wanted to go visit Tannenbaum which opened today. Ton and tons and TONS of winter goodies. Not just deco stuff either, there are hairstyles, shoes, and clothes available. They also have a tree lot and gacha ornaments available. Also opened is Lost & Found for it's third round. The vintage living room set from DaD Design caught my eye. The set comes with three different colour options and I couldn't resist using the red/green. Lost & Found is open from Nov. 22 - Dec. 1st. Fiasco has also come out with some many cute things for Christmas. The candy cane box, the ornament box, and the count down box are all from that shop. These pieces are featured at a few different events so I've included the LMs below. If there is anything I've missed or if you need more info. please don't hesitate to reach out to me in the comments or in-world.